We’re very excited to announce a new feature on MovingWorlds that will help us better connect people that want to change the world, with organizations changing it. In addition to improving the display of your profile as pictured above, it will also improve the way you display in search results (pictured below – as you can tell, the opportunity with the picture really stands out in the search). In search results, pictures of your city will show up on your cards to help you stand out. 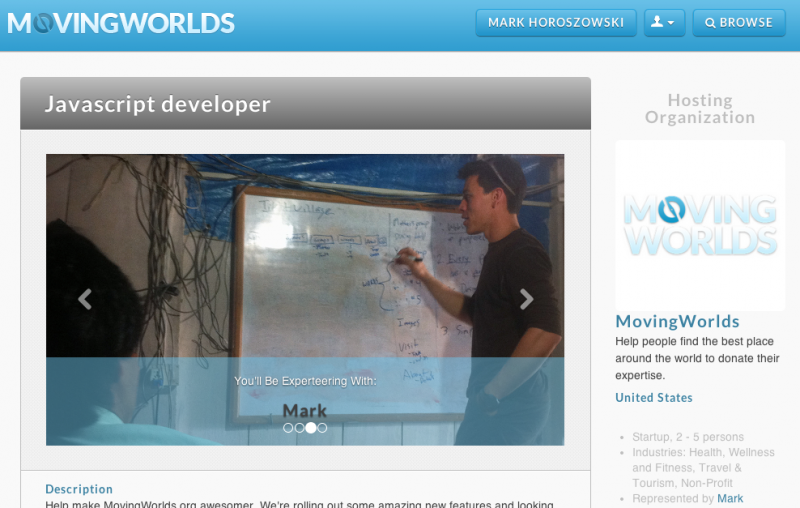 (if your organization is not on MovingWorlds yet, it’s also easy… just request an invite here). 1. When logged-in, either Add a New Opportunity or Edit Existing Opportunities. 3. For each photo, add a brief caption. These captions help tell a story. Keep them simple and to the point. The screenshot above shows how the caption will display. 4. Hit “Save and Continue” to save your pictures. On the next page, make sure your opportunity is published. Once completed, your profile will automatically display a photo on your opportunity during search and profile views to help find the best possible professional for your organization. What do I do if I don’t have pictures? You can usually find pictures of your city, country, and organization online. Look on your Facebook or LinkedIn page, scour your website, or do a search for photos on Flickr’s Creative Commons. This is the first of many improvements scheduled for the beta version of MovingWorlds.org, and represents our commitment to facilitating safe, high-quality, and high-impact matches of skilled professionals to social impact organizations around the world. If you want to see other features, please leave us a comment and let us know!